80-Acre Hoppy Wheat | Boulevard Brewing Co.
Full disclosure: Best by date was 1/21/13. A grassy smell with spices intermingling with each other as well as a hint of lemon zest. The grassy taste continues and the wheat taste gives it a bit of an earthy flavor as well. In addition, lemon is detectable through the flavors. the tastes tend to be subtle, which helps them blend rather well. Light to medium bodied with biting carbonation. The aftertaste is fairly refreshing and dries the mouth a little bit. I think that this is a good beer but that fact that it's five months past its best by date has probably affected the quality of this beer. Still, I'll probably pick up a stronger batch later on. Pours a murky straw color with a medium sized white head. Recedes after a bit leaving no lacing. Aroma sides closer with an APA that a wheat. Citrus hops dominate at first whiff. Followed up with the familiar what and lemon notes of the wheat side. Alternatively, the taste involves itself a little more to the wheat side. The citrus is present, but limited to a more subtle grapefruit and some moderate hops and hop bitterness. More prevalent are the orange and lemon notes. The citrus comes through a bit more as it warms, additionally revealing some surprising sourness and even more bitterness. Light bodied. Refreshing. Very drinkable. A perfect summer beer. Overall, a solid if unspectacular beer. Could've capitalized more on the pale ale part of the taste, but zeroed in a little bit more on the wheat aspect. It works, but not my personal taste. Still would be a great beer to down a six pack of on a hot summer day. Poured from 12 oz bottle into a pint glass. Nice head accumulation on the top with minimal lacing. At first smell, I couldn't pick up anything. It does have the citrusy bread smell associated with most wheats. I was a little underwhelmed. Its called Hoppy Wheat yet no smell of hops, no real taste of hops, and it looks like the IBU level is in the 20s. I expect quite a bit more for a beer with Hoppy in the name. That being said, it does have a different taste than a typical wheat. Its very drinkable and is a nice twist on wheat beers. Just wish they'd hopped it up a bit more. Zesty notes of lemon and tangerine meet grapefruit and mango and are accompanied by resin, floral notes, and wheat to form the aroma. Very complex initially, but lemon ends up dominating as it warms. Flavor pales a bit in comparison. Grapefruit, mango, and orange open the profile and are quickly replaced with wheat and lightly sweet, biscuity malt mid palate, finishing on the sweet side, but a touch peppery. Wish the hop flavoring matched the aroma. I don't find this terribly different from a very sessionable IPA, though the body is slightly smoother and more complex than the malt bill in most session IPAs. 80-acre was very drinkable for those who enjoy hops, and one I will definitely revisit. Pours a 2cm head of eggshell white foam, which descends rather quickly to a thin ring around the glass. Lacing is minimal, with just a few small lines and dots along the glass' edges. The body itself is a pale yellow color, semi-hazy, with light bringing out primarily the same tones. Carbonation is visible from the bottom of the glass, streaming upwards throughout. Aroma is blatantly, unabashedly hoppy, with strong grapefruit, lemon, an orange tones accompanied by a bit of wet pine mulch, as would fit a combination of Cascade and Nelson Sauvin hops (though I'd accept Simcoe as well). Delicious, with a subtle malt base underpinning all these hops. The flavor is simultaneously a fairly notable, sugary sweetness from the combination of pale barley and wheat malts and the strongly citric-bitter from usage of fruity, lightly citrus hops. Opens with sweet malts coalescing cleanly with grapefruit an orange-like hops, leading to a mid-palate of marginally sweet malts and lemon-orange-grapefruit flavors. Back of palate picks up modest bitterness along with continued grapefruit and orange flavors. Aftertaste of mild bitterness, some orange, and sweetness from wheat an barley malts. Beer is medium to medium-light bodied, with mid-level carbonation, creating a slightly fizzy, foamy, but smooth mouthfeel. Closes semi-dry, as expected from the substantial hop usage. 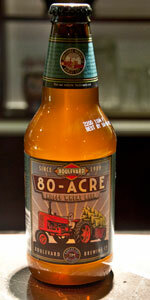 80-Acre Hoppy Wheat from Boulevard Brewing Co.